Firstly I found the facts on giving daan very interesting. You will come upon them when you have read most of the book and you are nearing the end. There are sixteen ways of giving daan. All of them are listed below. Tulapurusha : The donator of the daan should sit on the scale and gold should be placed on the other side until both the scales are balanced equally. Hiranyagarbha : A pot full of gold is donated. Brahmanda: A universe made out of gold is donated. Kalpapadapa: A tree made of gold is donated. Gosahasra: A thousand cows are donated. Kamadhenu: A cow and a calf made of gold are donated. Hiranyashva: A horse made of gold is donated. Ashvaratha: A horse and four chariots constructed of gold are donated. Hemahastiratha: An elephant and a chariot made of gold are donated. Panchalangalaka: Ten ploughs are donated, five made of gold and five made of wood. Dhara: A golden model of the Earth is donated. Vishvachakra: A golden model of the Universe in the form of a wheel is donated. Mahakalapalata: Ten creepers of gold are donated. Saptasagara: Seven pits are made in the ground, representing seven oceans. The first pit has a little bit of salt, the second milk, the third clarified butter, the fourth molasses, the fifth curds, the sixth sugar and the seventh holy water. An idol of a god or goddess is placed in each. Brahma in the first, Vishnu in the second, Shiva in the third, Surya in the fourth, Yama in the fifth, Lakshmi in the sixth and Parvati in the seventh. The pits are then covered with jewels to the brim. Ratnadhenu: A cow made of gold with different parts made of jewels is donated. Mahabhutaghata: A pot made of gold filled with jewels is donated. The building of a house should never happen during Chaitra, as the person who does this will inflict a terrible disease. The month of Vaishakha is a good time, as a person will have many cows. An individual who begins in Agrahayana has full granaries, in Magha attains all sorts of riches and in Falguna obtains gold and sons. Servants and animals are owned by the person who starts in the month of Ashada. If you start to build a house in Jyaishta and Shravana you will die soon; in Bhadra you will suffer all manner of losses; in Ashvina your wife will die and in Pousha your goods will be stolen. One story we commonly know is the story of Sanjana and Surya. There is a particular part that we don’t know about. When Sanjana took the form of a mare and was meditating so that Surya’s radiance would reduce. After Sanjana’s father had chipped a small bit of his radiance, Surya took the form of a horse and joined Sanjana. At that time, Sanjana gave birth to two twin sons. Those two twins were the Ashvini twins. This has not been mentioned in many versions. This was a part of the story I liked, as I haven’t read this in the versions of this story which I’ve read. The last part I liked was when Bibek Debroy talks about ब्राह्मण (Brahman). During the creation of the universe, there was darkness and the Brahman. We cannot describe the divine essence brahman, as it has no traits that can be described. The Matsya Purana says that the brahman repelled all the darkness, and divided itself into three parts. Those three parts are known as Brahma, Vishnu and Shiva. 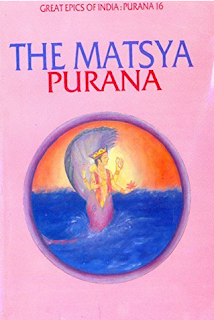 All the Puranas have different versions on the creation of the Universe, if you happen to read them. This I found to be the most interesting of the versions I’ve read of. It talks about the Brahman, which is the divine essence said to be formless. This is the part I enjoyed the most. It told me about Brahman, a term I had vaguely heard about.